Photos by Tommy Parker of Ginger Built Design. I'm often asked about the two favorite bags that I carry with me intermittently on any given day. The first, seen above, is my go-to, all-day-long backpack from Golden Ponies, a small company out of Mexico. Each item from the company is hand-made and this backpack is exquisitely crafted. At $125, the price is affordable and the bag will have a long, durable life. I find it's especially useful when I'm gone the entire day and need to carry my laptop, day planner, charger, wallet, etc., and walk around the city a bunch. 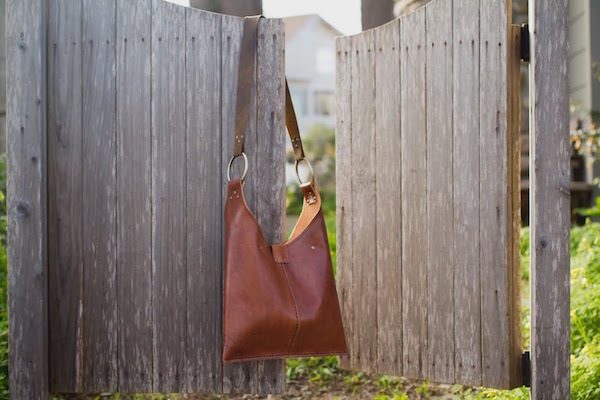 My other favorite go-to bag is this Nuala Leather Ring bag in a chestnut color. Handmade by Santa Cruz leather worker Terry McInerney, these bags sell for $200 at Stripe in Santa Cruz or through McInerney's Etsy store. What I especially love about this bag is its crossbody strap and strong structure, so I can jam it full of things (or not, I suppose) and it can stand up to the pressure of holding a lot of stuff. When I don't need my laptop, this is my daily bag—I can slide an iPad in it, a notebook, wallet, and more. Who said you only need one bag?